It's that time of year again... rhubarb season!! I have the most awesome memories eating rhubarb as a kid. 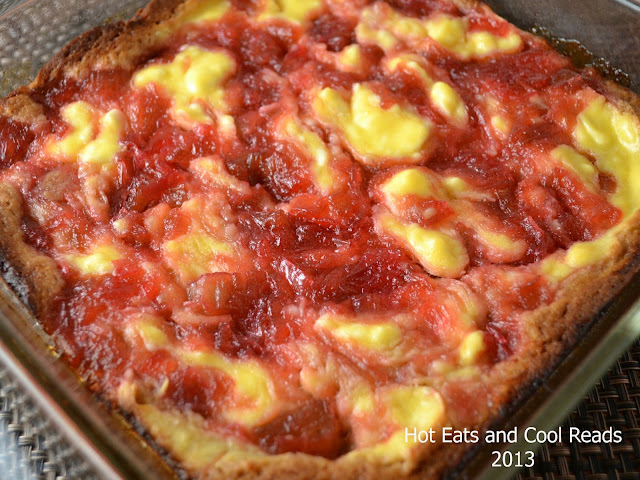 We grew up in the country, and there were always tons of rhubarb plants, which meant tons of rhubarb desserts! Yum!! We also ate it raw, with some salt sprinkled on it. The thought of it makes my mouth water! I was browsing my pinned recipes on Pinterest and found this recipe, but using strawberries. I decided to just use rhubarb instead and it worked out fantastic! I brought these to work with me, and they were quickly gobbled up by my Dad, brother and myself. We really liked them and it's a nice change from typical cakes and pies. I would like to thank my sister, Shannon from Speaking in Plain Shamish! She re-did my blog for me earlier this week, and I just love how it turned out. I am most excited that we now have a recipe index, which lists all of the recipes here on the blog. I hope you take a minute, browse through them, and find a new recipe, or two! In a small saucepan, combine rhubarb, sugar and lemon juice. Cook over medium heat until rhubarb is softened, about 10 minutes. Remove from heat and set aside. In a small bowl, combine 3/4 cup flour, graham cracker crumbs, and baking powder. In a larger bowl, combine butter with brown sugar, mix well. Add 1 egg, cinnamon and vanilla, mix well again. Add flour mixture little by little and mix together. Spread in a greased 8x8 glass baking dish. In that same bowl combine softened cream cheese, 2 tablespoons flour, and 1 egg. 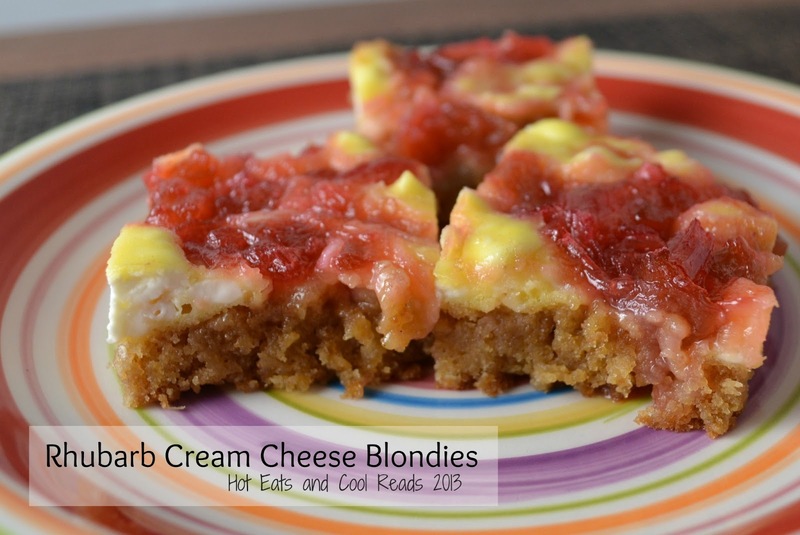 Alternate spooning rhubarb and cream cheese mixture onto the blondie layer. Using a knife, swirl to marble. Bake for 30-40 minutes until center is set. Cool and cut into squares. Wow.... this looks like it turned out so yummy!!!! Blog looks great. So easy to read. Love dessert also. Hi Sheena! Wow! This looks awesome! I think rhubarb is an acquired taste and as a child I didn't really like it much, but now I feel differently. It still needs a fair amount of sugar for my taste, but I love the tartness. Thanks so much for stopping by our blog hop today! We are so happy to have you and I look forward to seeing more of you and your adorable blog! While is only brekkie here, would love to try and piece now too! I love rhubarb and this looks wonderful. Thanks for sharing on our Sweet treats at Foodie Friends Friday... Pinning it and sharing on Facebook. 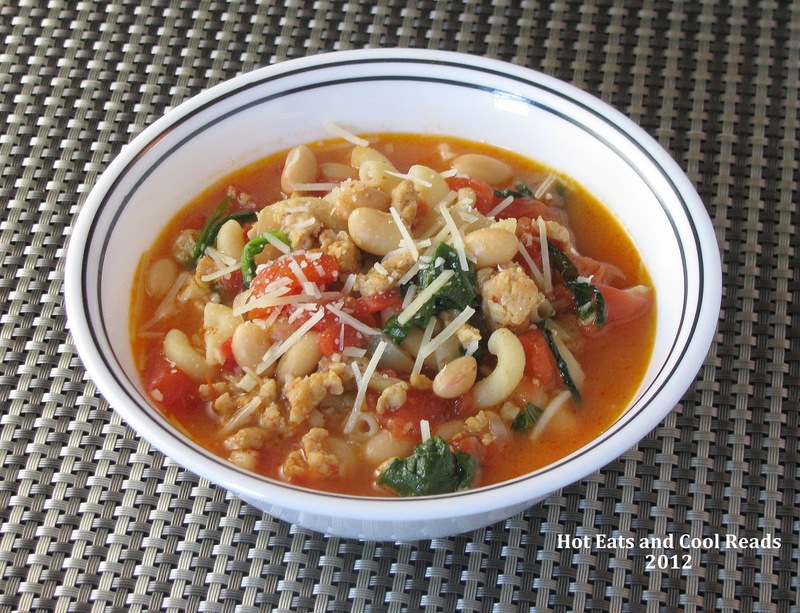 Sheena, Just to let you know that I have picked this recipe for my host favorite. It will be featured on the Daily Dish Magazine on Monday and on my blog post for the next party. RAH! RAH! for Rhubarb...and for Cream Cheese too - oh my! Pinning!!! YUM! I just baked with rhubarb for the first time and I am obsessed! Thanks for sharing on Foodie Friends Friday! I have a big plant in my back yard. Time to get baking :) Thanks! I love the rhubarb! These blondies sound just wonderful! 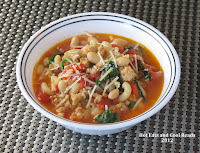 Thanks for linking this great recipe to the In and Out of the Kitchen Link Party! This looks so yum! Love the idea! Thanks for sharing at Super Sunday - hope to see you next week! Your recipe is being featured in a rhubarb recipe round up today on Simple Living and Eating. I will be pinning and tweeting it too.